Doesn’t this black and white drawing just look like it came from a book about old world folklore? It came from a 1907 Hungarian book about their folklore. It was written by Desi Malonyai (1866-1916), a Hungarian writer and art historian. No illustrator was identified. Gutenberg puts it in the public domain in the United States. I think, repeat I think, based on his date of death (over 70 years ago), the work is in the public domain everywhere. A mother or grandmother along with a young girl work together on a single project. 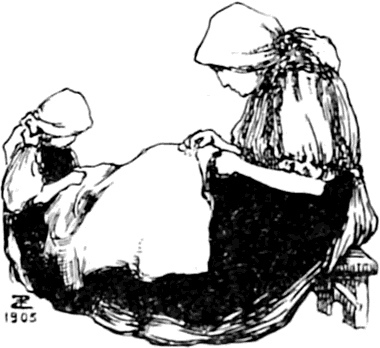 They are sitting knee to knee as they are sewing together. I think it would be a great scrapbook image for a multi-generational photo. You could even add a bit of color to make it compliment that photo.